President of Azerbaijan Ilham Aliyev has recommended the Prosecutor General to take all necessary measures to objectively and fairly investigate the case of prisoner Mehman Huseynov, based on the principle of humanism, said Fuad Alasgarov, Assistant to the Azerbaijani President for Work with Law Enforcement Bodies and Military Issues – Head of the Department of the Presidential Administration. 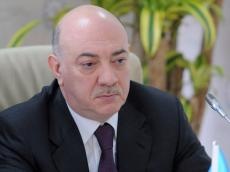 Alasgarov was commenting on Huseynov’s appeal to President Aliyev, Trend reports citing AzerTag. Alasgarov said that prisoner Mehman Huseynov appealed to the Azerbaijani president on January 20. To ensure the objectivity of the investigation being carried out in connection with his case and for a fair decision, Huseynov in his appeal asked the president to be involved in this process. Earlier, on January 18, a group of human rights activists also sent an appeal to the president in connection with Huseynov’s case. Human rights activists stressed that fuss is artificially created in connection with the case, false information is disseminated and attempts are made to create a false public opinion. The human rights activists emphasized the president’s constant commitment to the high principles of humanism and asked for clemency towards Huseynov. The appeals were brought to the attention of the president and he immediately responded to them. Taking into account that the prisoner is young, his marital status, his elderly father and that he has been serving his sentence for about two years, President Aliyev gave recommendations to the Azerbaijani Prosecutor General. According to the recommendations, the principles of humanism must be brought to the fore and all the necessary measures prescribed by the law must be taken for an objective and fair investigation. At the same time, President Aliyev urged those involved in the incident to take steps towards reconciliation. Earlier, a humane approach towards Huseynov was taken. Thus, while serving his sentence, he was released to participate in the mourning ceremony when his mother died after a severe illness. The president is always sensitive to such appeals. In his activity he always uses the principles of justice and humanism and demands the same from all the state officials. Dozens of amnesty acts, pardon decrees can testify to this policy. Hundreds of prisoners were released as a result of the president’s recent initiatives to humanize the punishment policy.